Doggles - ILS Shiny Blue Frame with Blue Lens Customer Photos - Send us your photo! This is Zeus, our oldest of three. He loves his clothing and also his goggles. Isabella is a very active dog. She loves the Beach and the Water. Here is Marley sunning on his glider! Bear loves his cool Doggles! They fit securely and provide protect while being super cute! Boo has no problem wearing his Blue goggles with blue lens that Mom got him from Baxterboo, I think he just thinks he looks cool! This is Rowdy. He thinks that he looks pretty dog-gone cool in his Shiny Blue Frame Doggles!!!! Shogun is a 7 year old Akita. He loves to ride in the car with protective eye gear. If you look real close, you can see his girl Hoshi in the background with her pink Doggles. Nittany loves cruising and sticking his head out of the sunroof while sporting his DOGGLES. Barkley starts sniffing the glove box (where we keep his doggles) the minute he gets in the car. He has made soooo many people smile and laugh when they see him hanging his head out the window wearing his doggles! Several have even taken his photo while we're driving down the street! Barkley going "indognito" while we wait at the post office. Do these make me look stylish? Luke - chillin in the Forida sun! max never Leaves home without his Doggles on. Boo was interested in what the other dogs were barking at, but he will learn to love his doggles! His eyes need to be protected when he is out in the sun and when he sticks his cute little face out the window when we ride in the car. Thanks for your great service!! Posted On 09/05/17 by diane ddecaprio from guilford, CT Yes, diane ddecaprio recommends this product! The Doogles are so cute !!! Posted On 06/14/17 by Chris H from Ellensburg , WA Yes, Chris H recommends this product! I love the looks of these. I didn't know if he would wear them but he loves them and he looks cool with them on. Posted On 02/11/17 by Marian S from Sunnyvale, CA Yes, Marian S recommends this product! Fits securely. Has sponge glued around the interior for comfort. I hope this lasts. This is the 2nd pair of Doggles I have bought. They are great! Posted On 07/10/16 by Cheryl F from Wilmington, DE Yes, Cheryl F recommends this product! 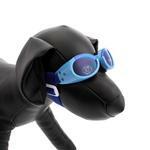 I love these blue Doggles and we now have a collection in many colors. They are well made and easy to measure for. I believe they are a must if you take your dogs to the beach especially on a windy day. Love the selection of colors. Posted On 12/14/15 by Yvonne R from Fernley, NV Yes, Yvonne R recommends this product! I love these doggles, my dog is patient when I put his winter coat on or his backpack. The Doggles are going to take a bit of getting used to for him but they are worth it for me to keep trying. We go hiking in the desert and when the wind whips up sand and debris flies everywhere. I got these Doggles to hopefully protect his eyes. Today it snowed like crazy when we were out on the trail and I forgot the Doggles. Will start carrying them with us in the car for sure. I like how securely they fit my dog's face. The elastic feels like it will last and has the right amount of give. The plastic feels durable and there is a ton of eye space so there is no irritation or interference with my dog's eyes. Posted On 07/28/15 by Kristina L from Blue Hill, ME Yes, Kristina L recommends this product! 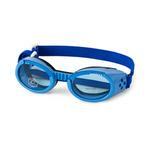 Who couldn't and wouldn't want their fury pets eyes protected and a bit of flare and style!!!!! Super cute super fun show stopper people attractor make your pup become the star and buy them some of these!!! Posted On 12/11/14 by Grisel M from Bronx, NY Yes, Grisel M recommends this product! These doggles protect my dog's eyes so well with the added bonus that it also makes him look fabulous! Everyone stops to gush over him. Will definitely recommend. Posted On 10/20/14 by Jane D from El Cajon, CA Yes, Jane D recommends this product! Love them. Have nearly all the colors. Posted On 10/15/14 by Grisel M from Bronx, NY Yes, Grisel M recommends this product! I love how Ookie looks with his doggles. He looks so goofy! He doesn't really like them much as of right now but they are also very difficult for him to take them off by himself. He tries for a while then eventually gives up. I'm sure he'll get used to it. I bought them in a size xs in case anyone wants a reference of how small they are. Will definitely be purchasing more in different colors! Posted On 11/07/13 by John D from Madison, CT Yes, John D recommends this product! Isaac the Afghan Hound looks real cool in his blue doggles as he rides around town in my TR-6 convertible. He's protected from the wind, sun and all the other nasty stuff in the air that can damage his eyes. I was looking for Cloak & Dawggie harnesses for my Italian Greyhound, who is super tough to fit. They don't make them anymore and I LOVED the selection that you had and the videos. I found two harnesses similar to the C & D that I'm going to try and if they don't work I saw another style that could in SO many color choices. Thank you for all of the fit information. Makes purchasing online so much easier!